This will all come to pass. Soon. Very soon. Be brave, you may only have one more night of this ahead of you. The entire Nepali diaspora is constantly thinking of you and your well being. We will overcome this tragedy. Below is some analysis that attempts to put your tired minds at ease as your rest this rainy night. I am writing this in response to speaking to my family, my wife's family, and extended family members and friends that are panicky because "NASA / BBC / America is forecasting a 8 to 10 Richter Scale quake will go off soon." First, nobody can forecast an earthquake. That is why its so devastating. Second, a 10 scale quake has never happened. Third, an Asian quake has never been larger than approximately 9. Fourth, a Himalayan belt quake has never been greater than the one you just experienced. Lastly, a larger quake following a smaller, first event is extremely rare.These are geologic precedents. You've borne the worst, in my opinion.See below's chart (courtesey of Pravin Tripathi) as to how extremely rare a 8-scale event is. You have been through one of the worst earthquakes in modern history. 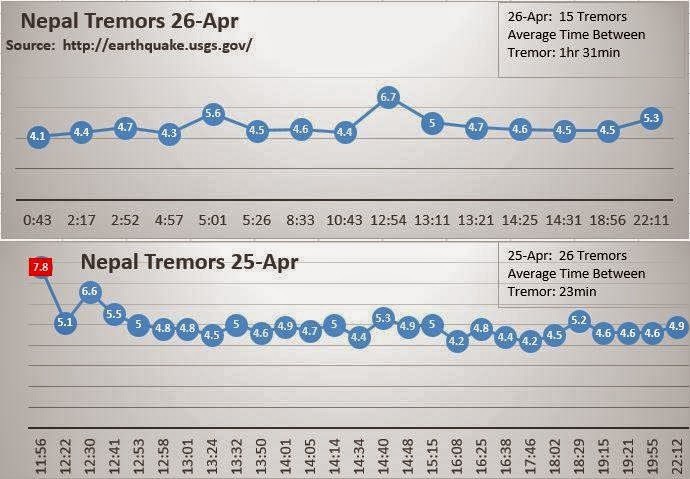 Since the major earthquake on 04.25.2015, a staggering 41 earthquakes have gone off in and around the Kathmandu Valley. However, only three have been greater than 6, and the lone 7.8 that precipitated this chaos. The intensity of the earthquakes are falling rapidly. 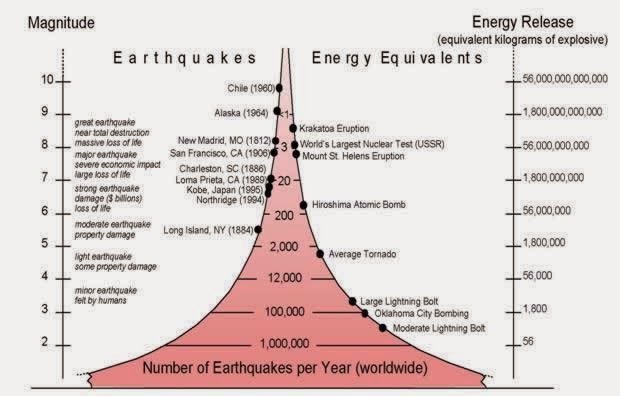 In this bleak moment, it is extremely important to understand that earthquake intensities are measured on a logarithmic scale. The Richter scale is misleading. A scale 8 quake is one thousand times more intense than a scale 5. The majority of the aftershocks at 4-5 scales are actually a fraction of the intensity of the original one. To be precise, one thousand to ten thousand times less intense. The strongest aftershock of 6.7 was 30-50 times less intense than the original one. Things will improve, the law of math promises it. Lastly, a total of 22 earthquakes went off in the first 6 hours of the first one. However, that intensity is falling rapidly. In the next 12 hours, only 10 went off, and in the last 12, only 7. At this rate, mathematically, the aftershocks will likely fall to unnoticeable levels by tomorrow (Monday) night. Hang in there. This will come to pass. Soon. Very soon. Below's chart, courtesy of the facebook disapora shows how the tremors are getting less frequent daily, a pictoral description of the above. Lastly, I can imagine your exhaustion with the aftershocks. The seismic event picture below complied from USGS, the only authoritative data repository, shows that every single earthquake in the last 2 days except the first 2 major events has gone off in the Bagmati Zone around Kathmandu valley. It must truly be exhausting. Be bold, Stay strong, squash rumours, and be Nepali. We've lost our Durbar Squares, but Pashupati and Swayambhu are still standing, tall and proud, like each and every one of you. God bless you all, and to quote my childhood school - "Karod diyo ko gham banera desh ujyalo paarne chhau"
Thank you very much for your positive words. It was really good hope and strength to all nepalese people around the world. Stay safe and strong. And we will bounce back and will rise again. Thanks for the analysis and postive works, this will certainly give us courage to stand and build our strength to Support our country. Wanted to point out a few things, while it is correct to say that the Richter scale is in logarithmic scale, the scale only applies to the amplitude of vibration. In terms of the actual energy released, each increase digit corresponds to about 31 times increase in energy. So a 6M quake would be about 31 times weaker than a 7M quake. In terms of the decreasing intensity of quakes, it would be wrong to claim that it will definitely die down. Experts have said that it could take days if not months for the movement to be slow enough not to be felt. The 6.7M quake that hit 24hr after the initial one followed by two quakes above 5.0 indicate there could still be more in store. I appreciate your intentions of trying to calm people, but I wouldn't want people to let their guards down based on limited information. The entire analysis of earthquakes is based on limited information. They are not predictable, cannot be forecast and are only analyzable in restrospect The temporal intensity is falling 50% every 12 hours. Those are recorded events. Furthremore, there has been no recorded event in history where a stronger intensity quake followed a weaker one. The globe routinely deals with sub 6 intensity earthquakes. One actually went off in Jumla 4 days before the major one in Barpha. The 6.7 scale event was on the other side of the Bagmati plate near Kodari. The intensity will fall. It will fall enough so that our families can go to sleep and not participate in rumours of another 8-10 scale quakes. The only thing that we have to fear, is fear itself. thanx for ur concern and analysis... great help indeed!! Thank you my dear friend, as a fellow scientist and geoscientist, I couldn't thank you more for this amazing simplified analysis. Once again thank you. Thank you, for your wonderful approach, and your thoughtful article. Emotional crisis can be debilitating at this very moment. We are so appreciative . that is good of you to squash the rumors scientifically. Thanks for your update. Felt better after reading it.